…not by wielding their knives, but by nurturing their wombs! 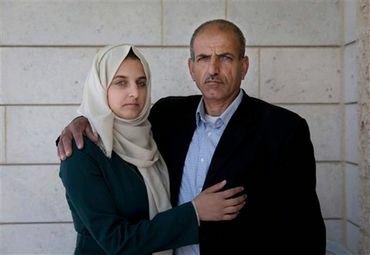 "Last week, the girl's family appealed to Israeli military and prison officials to release her, citing her age. By contrast, Israeli settlers, as well as Jewish and Arab citizens of Israel, are subject to Israeli civil law, which does not allow anyone under 14 to go to prison." "What would happen in Israel if the possesssion of a wapon by a Jew who fanticized about killing an Arab became a criminal offense? Arrest half of Israel's entire population?" If I think for a moment about the fact that little settler kids as young as 7 are handling fire weapons and are sent to camps to be trained ... the chills creep up my spine. The Zionists always accuse the Palestinians and Arabs in general not to love their children as much as "Jews" *) love their children ... yet they have no problem to put their families willfully and knowingly in harms way (which can be deadly at times) in transferring the most fanatic settlers to the Occupied Territories to live there, give them full military protection ... and blame the Palestinian civilians who are displaced by those fanatic settlers for the resulting violence. Add to this how the parents of those settler kids train their children systematically to hate and attack those Palestinians (Christians and Muslims alike) and oversee their attacks. Look at the toddler at 3:09 who can barely walk but learn already how to throw stones unto other people's house. Take a good look at the stone the boy is about to throw at 3.12 - if one gets this on the head the undertaker will have some work. *) I put Jews in quotation marks because they go against everything that true Judaism teaches but follow what this wicked Zionist ideology tells them to do. Yes, one seldom hears about the settler kids throwing stones - before they are big enough to have their own guns .... or setting their dogs on villagers ..... Although there is plenty of documented evidence (not just these clips). Dogs attacking a kid - would be put down in (other) "civilised" societies. Sick - unequal justice at work. I had read the article before I realized it came from the Miami Herald who reported the incident in a - let's say - very un-American way. Kudos to the newspaper for printing Areej Hazboun's version which includes a lot of background to the intended stabbing of this child and to the discrimination Palestinians on the West Bank face, their land occupied and now stolen by the Israeli while there's only the very harsh military "law and justice" - so euphemistically called administrative detention - for them, but not the Israeli law that the illegal settlers can rely on. For Palestinians on the West Bank there has been no national or international law for generations, which must also be a contributing factor in the cycle of intifada and violent outbursts among Palestinian youths. Of course attacking Israelis with knives and scissors, killing 30 altogether, is wrong and terrible, and my heart goes out to all Israelis who have to live in fear, not knowing where the next attack is coming from. But killing 188 young Palestinians is equally wrong and disproportional and unjust and harsh new "administrative" laws and further tightening of security is not going to put an end to it. Not while the West Bank is in the process of being annexed in all but name, and Palestinians driven from their homes and villages to make way for settlers who then have the Israeli law to protect them. Israel is still in the process of wanting to have it's cake and eat it too, blaming the baker for not baking enough cake while his children are starving. And many ask why the USA turns a blind eye to all of this. In the US, there are 2,270 prisoners who were sentenced as children to life without parole. They will die behind bars. Six of them were 13, and 50 of them were 14 - an age at which US law forbids them to drive a car, give medical consent, vote, leave school, sign a contract, drink alcohol in a bar, serve on a jury, be drafted in the army, live away from home. Yet they were tried as adults in an adult court and given no possibility of a second chance. The U.S. Is Locking Up Immigrant Children in Private Prisons Under Inhumane Conditions. The message being sent by the U.S. government is that when frightened women and children come to America seeking sanctuary, we will imprison them. When one lives in a Country such as I do, the USA, the so called beacon of the free world, that more people do not speak out from here about Israel's treatment of children, the so called only democracy in that area, can perhaps be seen with clearer eyes. Israel and the USA tied at the hip.....both Countries have some deep soul searching to do. Both are much lesser for operating in the ways that they do. Both use propaganda to instill a different picture than truly exists. I know in the USA we do not get these stories on the mainstream media, which a majority of the people DO receive their news. I'm thinking that perhaps this is true also for Israel, they hear the one sided story or are kept in the dark. As with here, I can only hope more people start looking into alternative news sites, such as using all sorts of internet sites, and switching on the TV to other channels like Al Jazeera the BBC or any other out of the USA coverage they can find. The USA could have a lot of clout and sway as to what is taking place in Israel, but if it doesn't clean up it's own backyard, worse, if it doesn't even feel it's own backyard is a mess, then I don't see where much of a pressure will come from the USA. I can only hope the rest of the world will do what needs to be done while we, in the USA, get our own acts together. Thx Sam. You sound like Ayelet Shaked in your 1st comment.. and are probably quite correct with that statement. Nothing to add except they just have no shame and few, if any, humane feelings. But then, this isn't new and I've said so before. Israel is its own worst enemy. She is just a child. It is the person (or persons) who filled her head with such hate who ought to be in jail. I agree with you, John. That's why I wonder why Netanyahu is still a free man! In the case of Israel and the United States MONEY is all "up there in it." Follow the international beneficiaries of wars: the makers of: weapons, uniforms, pharmaceuticals, special equipment, vehicles, investors, bankers, governments, etc.. Greed funds wars and hate is the fuel these criminals use the keep it going. Netanyahu is a free man because he feeds the soldiers of hate. He keeps the money flowing. Remember, the leaders who Bush and Obama killed were keeping the peace in their own countries...peace. Sam: Always Israel. No, they're certainly not blameless, but you can't bring yourself to condemn the Arab hate merchants can you. They teach Palestinian children to hate Israelis. And when you teach people to hate, it always results in violence. Why don't these brave hate preachers do their own Jihad instead of sending little girls to do it for them? Hamas are a reaction to Netanyahu. Netahyahu is a reaction to Hamas. it's a vicious cycle. They both should be voted out of office. End of. Until Netanyahu is voted out of office, what do Palestinians have to do to qualify as freedom fighters in your book, John? "And when you teach people to hate, it always results in violence." => The extremists in Israel (and that includes even those who write school textbooks ... as pointed out by several Israeli educationalists) teach hate to Israeli Jewish children - institutionally & systematically. (Nurit Peled found far less twisting of facts to promote fear & hate in Palestinian school texts ....) This is designed to reinforce political Zionist thinking .... and is backed up by training in use of arms - and then by the "standard" brainwashing that happens to conscripts in armies ... IDF in this case! => Most Palestinians do clearly distinguish between Israeli Zionist politics, strategies & actions - and ordinary Israelis. What they grow up hating is the Israeli government-supported oppression & occupation ... Much as do any oppressed and occupied people ..... And most Palestinians respond well to those Israelis who recognise the abuses perpetrated against the Palestinians, and who make the effort to come in friendship. Granted - for Israelis already brainwashed that all Palestinians hate them, are sub-human, have no right even to be in their land .... the violence of the resistance fighters just confirms their fear and hate ... and they generalise to a whole people the acts of a few. Although she's been released, her fathers' work permit was revoked. Terribly wrong. Lois - that's Israeli legal system - collective punishment for Palestinians (not Israelis) .... I wonder whether they will appropriate the family home as well .... if they haven't already done so. Noted. More of the same. Thanks Sam. They actively TEACH children to hate Israelis and incite them to kill Israelis when they grow up. How can there be any prospect of peace in such an environment??? Recently we have seen a spate of teenage Palestinians go on stabbing missions. Whether they 'succeed' or not, those who incite them to go know full well they're going to get shot dead. These are children!!!! What next?, strapping suicide bombs to them? Sam, as you allude to - one man's terrorist is another man's freedom fighter, fair enough. But exploiting children by brainwashing them into potential murderers and sending them to their deaths ... Violence is never he answer, but if these hate preachers want to wage war, they should do it themselves! And of course there are Israelis, the ultra Orthodox ones especially, who equally hate, no one is saying that there aren't. As said earlier: "And when you teach people to hate, it always results in violence. " These youth are acting individually - it is not "organised" freedom fighting. But every time IDF kills several "suspects" - often extra-judicial killing - they are teaching hate. And violence generates more violence. If people have hate in their hearts, do it to your own. Don't take it out on innocent foreigners. It is 'organised'. Children are taught in school classrooms to hate Israelis and incited to kill them when they're older. They are exposed to the same message on television. There is one particularly infamous children's television programme, made by the Hamas government, in which children are incited to "kill the Jews", "all of them". The children they use in the studio filming are only about five years old. Google it. There is huge amount of information. And then there is the grotesque 'Stab A Jew' chart, as if more proof were needed. Back to topic: Maybe Sam and Evelyn would like to say what they would do??? I ask in all seriousness, because its easy to throw stones, less so coming up with answers. 1) Do nothing. Let her murder an innocent person and get herself shot dead. 2) Detain her to prevent her murdering an innocent person and getting herself shot dead. 3) Forcibly remove her from her family and take her into care. 5) End the occupation and get out of her land! I bet that didn't occur to you, John! Evelyn: Which is what? Take her into care? Section her? Sam: Dodging answering. No, come on, answer properly. You are quick to condemn, what would you do? I'm not sure this conversation can lead anywhere, John, if you still consider even the suggestion of ending the occupation improper. Thanks for illustrating the point, though! Sam: You can't answer. Whether you'd let her murder an innocent person and be shot dead in the process, or do exactly the same as the Israelis did, I'm not going to guess. As I already said - I would ask for due process of law, a just law identical to that applied to Israeli juveniles of the same age category - which (the point of this article) is not currently the case. I do not consider myself to be a qualified lawyer or judge, and have no intention of carrying out lynch mob-style justice. Due legal process for young juveniles implies full inquiry, legal aid, experts etc ... when it is not a kangaroo court based on direct condemnation without trial. I’m not sure it takes any more qualifications than being a Zionist to condemn a Palestinian child! That alone embodies all the hatred necessary to wish and cause harm to anyone who disagrees with their twisted, fanatic views anywhere in the world. The Palestinians are only the most visible example of all those who are victimized by them. We/you ALL are victimized by zionist twisted, fanatic views, anywhere in the world! Forced to give up, at least challenged the right to free speech, the right to boycott, just to name these! No need to be a Palestinian to get harmed, quite true! I for one, DO consider myself a victim as well and not solely for the examples I named..
Evelyn, Sam, Angelika - can't send you any more stars at the moment - a galaxy for your comments, especially Sam's "5) End the occupation and get out of her land!" It's truly a weird thing that the most obvious never occurs to those upright fighters: stop applying Aspirin and remove the cause of all the violence and hatred instead = problem solved. That's be the ABC of conflict solving - not that difficult after all! These lies and activities are the true inciters for violence - anyone who doesn’t see and understand this is either a) absolutely gullible, b) has not much of a cognitive ability or c) is simply a hasbaratchik troll. Violence is the symptom – Occupation is the disease (Uri Avnery). It IS that simple and straight forward! Evelyn: When you have a 12 year old child running round determined to murder people, you don't need a law degree to know she is either going to be sectioned or taken into care. That much is obvious. I see not one of our 'not the least bit anti-Semitic' friends here is prepared to condemn the hate preachers who filled her head with hate. They seem to stop perilously short of condonement. A reminder of the film 'PROMISES'. A group of Israeli and Palestinian children were brought together, after initial suspicion and mistrust, on getting to know each other they became friends. Yes, it IS simple and straight forward. Stop preaching hate! I am VERY happy to condemn ALL those who preach hate, John. What I refuse to do is to deny that there are hate preachers on both sides. I refuse to state that PALESTINIAN education teaches hate consistently, when studies by Israeli Jews say otherwise .... and the same education specialists say that the Israeli education system is RIFE with misinformation & hate/fear provoking elements. SOME Palestinians may teach hate - and are greatly helped by the behaviour of Hilltop Youth, extremist settlers and many IDF soldiers ...... This kid is living in an environment that breeds violence - and the occupation is a primary factor. But there are not currently the teaching of hate among Palestinian leaders that is coming from extremist rabbis - who are coming out with endorsement of extreme violence. When the anti-Palestinians give examples, they have to go back to old references ... early Hamas narratives, the period when suicide bombing was taking place - but that position has now been condemned, the last cases were almost 10 years ago. Even Israeli authorities are having to recognise that the current wave is more individual than structured ... which makes it much more difficult to pin down and prevent. These attacks are not good for Palestine, but they are a symptom of loss of any hope for progress towards equal justice, end of oppression & occupation. There are many efforts bringing Israelis & Palestinians together - a school in Israel where this was working very well was forced to close (guess by whom! Pro-Zionist right wing pressures) - much to the disappointment of Jewish & Arab families whose children were attending. The Tent of Nations continues to function despite frequent efforts to destroy the farm & prevent its work - by the Israeli occupying powers. Israelis join Palestinians on demonstrations. Evelyn - thank you for listing for the umpteen time what facts on the ground really are and who is sabotaging all these ongoing projects where people from both societies work to find common grounds. It is Israel who is constantly and without failure sabotaging each and every project where there might be a glimmer of hope. Each time- and there is ample and irrefutable proof to this systematic Israeli behavior. Why do we need to "condemn" time and again just in order to satisfy some troll's demands and in order to ... not ... avoid being labeled "anti-Semites"?! On top of it just based on some lose statement that "someone filled her head with hate"?! Rather than pulling some worn-out statement out of the dirty cuff - why don't we simply look at facts (see links below)? Do I need to mention that not ONCE in all these years that I'm debating and discussing with pro-Zionists and "righteous fighters for Israel" aka Hasbaratchik trolls have I read one single word of condemnation by any of them for the continuous and systematic hate preaching (the rabbis) and teaching (teachers and schoolbooks) by Israel . Not once! ““The early textbooks tended to describe acts of Arabs as hostile, deviant, cruel, immoral, unfair, with the intention to hurt Jews and to annihilate the State of Israel. Within this frame of reference, Arabs were delegitimized by the use of such labels as ‘robbers,’ ‘bloodthirsty,’ and ‘killers,’” said Professor Bar-Tal, adding that there has been little positive revision in the curriculum over the years. “According to a November 2001 paper published by George Washington University Professor Nathan Brown, "the Palestinian curriculum is not a war curriculum; while highly nationalistic, it does not incite hatred, violence, and anti-Semitism. It cannot be described as a 'peace curriculum' either, but the charges against it are often wildly exaggerated or inaccurate." End the Occupation and stop the oppression of the Palestinian people - say yes and work for a just 2-state solution. It IS that simple and straight forward. As always it is in Israel's hand to stop the ongoing violence. But as long as Israel doesn't want and profits most from the status quo ... the Palestinians will pay the price and the political world applauds to the efforts Israel makes to "combat terrorism". One hell of a just world we live in!! But hey - don't forget: it's always the fault of the Palestinians/Arabs (Christians and Muslims alike! "She is just a child. It is the person (or persons) who filled her head with such hate who ought to be in jail." Did you see in the news in Britain where two young TEENAGE girls submitted a young women to a 5-hour ordeal of verbal and physical abuse, culminating in killing her? They thought it was funny to take pictures and post them on social media, attacking her with a TV and spade. James Bulger's MURDERERS were also the same age as your young Palestinian girl. Whilst I agree that the people FILLING their heads with nonsense should be brought to accountability, they is the accountability, responsibility and justice that needs to be applied to young adults who think they can get away with atrocities as well. But in the UK there is one form of justice applied to all juveniles, irrespective of race, religion, ethnicity - and there are courts to apply the single judicial code. The perpetrator is examined by experts, and their analyses are included in the judicial process. In a context of equal justice, due process establishes appropriate punishment. The point of this story is that no such equivalent exists for Palestinians in such circumstances. "...12 year old Palestinian girl imprisoned by Israel for allegedly attempting to carry out a stabbing attack in a West Bank settlement.."
Darren, I don't understand your comment. All parties "should" be held accountable. Justice "should" be served. Well, as we've seen and continue to see "Justice" depends on which country and who is in charge. So, there's no consistency. The James Bulger murderers were released from prison after a European court ruling that said they have been UNFAIRLY treated in an adult court setting. So, based on this ruling, this child should have not been treated how she was. Don't we know our "friends", Evelyn - LOL? I guess this is why we still try to make the truth on both sides known but especially what is done to the vilified and demonized Palestinians. Hasbara as well as the very official Israel has and is still doing and excellent job at this. What always gets me is that our Hasbaratchiks have no problem of being exposed time and again for what they are incl. their lies (remember Alexa?) ... but keep popping up in the next thread with the exact same worn out and "adjusted" statements. They don't seem to have much self-respect or dignity for that matter. As I stated in my comment above of Friday April 15, 2016, 2:15 am it is quite clear to a blind man who the real inciter and the obstacle to peace is: "Netanyahu Claimed That New Building Plans Wouldn't Expand Israeli Settlements; Aerial Photos Prove Otherwise " - one just needs to read this article to which I've provided the link in the referenced posting of mine. This IS active incitement and provocation to violence by those who are again and again robbed of their land and livelihood and nobody in the right frame of mind would expect anything less than hate and a feeling of total helplessness - especially also given the inactivity as well as the unwavering support Israel gets for such acts. Oh yes ... I know that Killary Rotten Clinton ... or was it Obama (six piece or half a dozen - it's only lip service anyway!) who said that "settlements are not helpful" ... WOW how dare they say such things????? Yes, Israel is very busy - WITH the consent of the international political audience! - to eat the pizza slice by slice until there's nothing left. Once nothing is left except some ghettos then they'll cry and demand that the international political leaders find a solution (read: transfer) because they can't possibly live in constant fear of being attacked by those "utterly violent terrorists" who they (Israel) were forced to put in the ghettos out of fear for being "driven into the sea" ... which will happen if they don't get transferred out of "Greater Israel" ... etc. ... that'll be the probable scenario once they're done with grabbing the last piece of land. Not that it'll stop there - Eretz Yisrael is to expand beyond what we know as Palestine and Israel today. Or like the chief-terrorist Yitzhak Shamir said (Time, January 30, 1989) "We hate those P.L.O. people because they make us kill Arab children." That's what I'd call Chutzpah! Ops - it should naturally read "This IS active incitement and provocation to violence by Israel of those who are again and again robbed of their land and livelihood ..."
Darren - thanks for the clarification; now I understand your comment of Friday April 15, 2016, 2:31 pm! No the girl should not have been in prison. Though as she was imminently planning to murder people she had to be detained, for public safety - and for her own, because she would have been shot dead. "No the girl should not have been in prison. Though as she was imminently planning to murder people she had to be detained, for public safety - and for her own, because she would have been shot dead. The normal recourse to law would have been to have her sectioned or removed from her parents and taken into care. I'm not sure why that wasn't done. I can only assume its because the system isn't geared up to deal with psychopathic children"
If you want to be pedantic ... A US study found 49% of Israeli school (relevant) textbooks contained 'negative' attitudes towards Palestinians. This rose to 73% in Orthodox Jewish schools. And 84% of Palestinian school (relevant) textbooks contained negative attitudes towards Israelis. No, such negativity is not conducive to the peace process, but that is something quite different to blatantly advocating 'shoot all the Jews'. 'kill all the Jews', 'stab Jews'. When a 12 year old child is 'brainwashed' into wanting to commit murder, something is very, very seriously wrong. As to your monstrous defence that the child was somehow justified in seeking to murder innocent passers-by because Israelis are holding land they think is theirs (though Israelis might equally say it is their historic homeland), words fail me. Is that your answer? Sending children to commit murder? Maybe Tibetan children should go round stabbing innocent Chinese passers-by, or Indian children stabbing Pakistani passers-by, or even Kuwaiti children stabbing Saudi passers-by (because they took half their country) etc. etc. Many in Europe object to immigrants being in their country. Should those of that mind send their children to stab immigrant passers-by to make them go away????!!!!! You could only scoff, why is that I wonder?, when I mentioned about the film 'Promises' A group of Palestinian and Israeli children are brought together, and without the hate preachers (on either side) poisoning their minds, find common humanity, similarity, and they become friends, good friends. Shedding tears when they parted. That is the way. Hate and violence will achieve nothing, except more of the same. It's reconciliation and the hand of friendship that is needed. Evelyn: Its not normal for 12 year olds to be psychopathic. The system is not geared to psychopathic 12 year olds, of any race or religion. John, seems to have 'selective attention', refusing to understand or believe that Palestinian children's human rights are abused and violated, on a routine basis, by the Israeli court system and occupation forces. Putting words in people's mouths that they never said is typically dishonest. Making judgements without having all the facts is equally dishonest . The situation is complex - but there is more will to communicate from the Arabs than from Israeli Jews ... although there are more and more Israeli & non-Israeli Jews who are reaching out to Palestinians as well. John states: "...innocent passers-by because Israelis are holding land they think is theirs (though Israelis might equally say it is their historic homeland), words fail me. Is that your answer? Sending children to commit murder? Maybe Tibetan children should go round stabbing innocent Chinese passers-by, or Indian children stabbing Pakistani passers-by, or even Kuwaiti children stabbing Saudi passers-by (because they took half their country) etc. etc. Many in Europe object to immigrants being in their country. Should those of that mind send their children to stab immigrant passers-by to make them go away????!!!!!" I took John’s advice and thought about these conflicts … although comparing apples with Timbuktu is not my strength … this is the minimum what is required here if one would want to compare. Nota Bene: I do not look at settlers as “innocent passers-by” as John wants them to be perceived. I rather look at them as what they are: illegal occupants (re: The Geneva Convention) who are putting themselves, their wives and their children knowingly and willfully in harm’s way. They are armed to their teeth and have full protection by the IDF even if they go on rampages and attacks against innocent Palestinian residents of the occupied area. John makes it sound as if Tibet is quiet and peaceful. Tibet has its fair share of “terrorists” … what used to be called freedom fighters … and I assume many of us remember the Lhasa violence of 2008 as an outstanding incident (comparable to the intifada) and as recent as February of last year the government of China’s Tibet Autonomous Region offered rewards of up to 300,000 Yuan for tips on potential violent terror attacks. Assuming that he refers to the Kashmir dispute one would have to go back to 4249 B.C. if one wants to do it justice. This conflict could and should have been solved when Britain created India and Pakistan – but it wasn’t (?). The LoC would be today the logical solution in order to correct past mistakes and to accept realities. Comparing the illegal occupation of foreign territory – that’ll be the West Bank – with e.g. past disagreements between Kuwait and Saudi Arabia (Saudi-Kuwaiti Neutral Zone) is an insult. The residents of this disputed zone never faced anything remotely what the desperate residents of the West Bank are undergoing day in and day out since many decades. Neither did people from Europe come and invaded that stretch of land and claimed it as theirs based on some fuzzy history. But even if that fuzzy history were true to the last dot – one can’t claim a piece of land just because one is a member of a specific religion or has converted to a certain religion. This applies to all religions just to be clear on this issue. It’s simply a ridiculous claim and ought to be outright rejected. The comparison with the immigrant situation in Europe is just preposterous and not worth to be addressed in this context. What the situation in Palestine should and must be compared with is simply violent colonialism – something all past colonized countries stood up against and fought until they achieved independence and until they got rid of the occupation by foreign entities. Palestinians are since long willing to settle for the remaining 22% of their ancient homeland. But for the European and American Zionist invaders this is not enough. They want it all – a land which never belonged to them in the first place. The Sephardi Jews (the real Semites very much like the Arab Christians and Muslims) have always and will always live in this land. As for the “historic homeland” … if this would be anything to go by … the whole world would have to start packing and moving. And one more time just for the records: while I do not condone violence I do understand that people in desperate situations take desperate steps and actions. Who can truly condemn them if they had enough of the unwillingness of the Israeli GovernmentS to achieve a just and lasting peace between equal partners? Who can truly condemn them if they have finally come to realize that the international political community – a.k.a. prostitutes – gives a hoot about them, their rights and their lives and are either incapable to stand up against an ever expanding Israel or are simply unwilling to do what is right because it suits their own agendas? Evelyn - do I only see this or does it catch your attention too? While you and I always provide sources as evidence of what we're saying ... other participants just throw in a few figures and that's that. Take it or leave it. How much credibility do I have if I tell you that recent studies have shown that 11,5 % of the violet ants in the Amazon prefer Maca roots and 28,9 % prefer normal food ... if I don't provide a source for my statements and numbers? Or could it be that this study is a typical PIOOMA-Study? Jess - you should understand by now that Palestinians have no right ... to have even basic human rights!! What's wrong with you?? After all they are only two-legged animals or cockroaches or similar ... ask the Israeli leaders, they'll tell you in detail! Thanks for the links, Evelyn. Very informative. I can identify with Michael Kaplan's article: he keeps saying that "Jews don’t really seem to care." and in his last paragraph he puts it straight - knowingly or unknowingly? "And now, we have yet another confirmation that Israeli children also learn to glorify and aspire toward violence, and — surprise, surprise — no one really seems to care." No one really seems to care ... he forgot to add "because they are Israeli kids". Would these be Palestinian kids it would be all over the international media and spread wide and far as yet another proof that one can't live with them and peace is just an illusion. Basically, then, children are caught in the crossfire of a stupid adult issue of territorial control and warring sides. If children are brainwashed, conditioned into perpetrating evils which they don't actually see as wrong, that's a pure indication that the environment itself is fundamentally unsound and unreasonable, AS THIS IS. No to racism and ethnic cleansing of Palestine! End the illegal occupation of Palestine and U.S. aid to Israel! Israeli state oppression, illegal Israeli settlements and land thefts, Palestinian home demolitions, evictions and the ethnic cleansing of Palestine by the state of Israel, are crimes against humanity, under International Laws, and must be stopped. Eleonora - you are better than I am at giving sources!! But - yes! Great post, Darren. You've hit the nail on the head. You can't hate your way to friendship and you can't stab your way to peace. Hi Evelyn – for once we’re not on the same wave length ;-). I was not talking about all those “comments” allegedly made by us which are so easy to be proven lies. BTW thanks for the links to newer studies. I’m glad to see that the newer studies show that Israel has corrected many of the schoolbooks and that such Nazi-terms like “inferior, bloodthirsty, …, etc.” when talking about the Palestinians and/or Arabs and which Prof. Bar-Tal found when conducting his study have finally been taken out. This article you linked to “Do Israeli and Palestinian Schoolbooks incite hatred?” made interesting reading and shows one more time (as so often in the past) who has a true interest in working towards and achieving ultimately peace. Strange enough … it is not Israel … who at every opportunity tells everyone that all they want is to live in peace … Why am I not surprised? I took the liberty to emphasize certain parts in putting it in capitals. “Precisely how the bias is supposed to have crept into this blind study—which was led by Israeli and Palestinian academics from across the political spectrum, and supervised by a scientific advisory panel composed of the most distinguished international experts, including a winner of the prestigious Israel Prize—the Ministry of Education doesn’t say. But the Israeli Ministry, it seems, felt threatened by the study’s results. “UP UNTIL NOW, THE WORD ON THE STREET WAS JUST FINE FOR THE ISRAELIS: THEIR BOOKS WERE GOOD, THE PALESTINIAN BOOKS WERE BAD,” Wexler explained. “LOOK T HOW FREQUENTLY NETANYAHU MAKES THAT POINT IN HIS SPEECHES. IT’S A VERY COMMON TALKING POINT FOR HIM.” This new study muddied those waters – not something the Israeli government was interested in. BY CONTRAST, THE PALESTINIANS HAVE BEEN POSITIVELY ENGAGED WITH THE STUDY FROM THE START, EVEN THOUGH THEY KNEW THAT THE ISRAELI STATE BOOKS WERE STATISTICALLY SIGNIFICANTLY BETTER. Both the Palestinian leadership and those who have external influence in the Palestinian community have shown a great interest in improving that community’s books. The UK International Development Fund and the UK Foreign Ministry, who have funded the development of Palestinian textbooks, have been eagerly awaiting the results of this study so that they can use them to make the books better – which is to say, more conducive to a culture of peace rather than a culture of conflict. THE ONES WHO ARE THREATENING THAT PROCESS, IT SEEMS ARE THE ISRAELI LEADERS THEMSELVES. Better stock up on whitewash then - assuming there's any left.! "Egyptian policy towards the estimated 50,000 - 70,000 Palestinians residing on its territory has resulted in depriving them of basic rights. .. Consistent denial of rights has eroded, not bolstered, Palestinian identity. "- Refugee Survey Quarterly March 2016 (The Palestinians In Egypt)"
And Egypt has a total blockade on Gaza, which the Israelis don't. 1st, You're way off in your citation. 2nd, Why are there Palestinian refugees in Egypt in the first place? 3rd, How does Egypt's mistreatment of the Palestinians justify Israel's? Sam - he ALWAYS justifies wrongs by wrongs! Another prime example of careless references!! Although I don't see what the comment has to do with the subject under discussion .... yet another distraction. And it raises a whole area of discussion that doesn't belong here. The logic certainly read Israel's resistance to any return correctly, but totally underestimated the extent that the international community would support application of International Law on the right of return of the displaced. Sorry Sam to place this "out of context" statement .... but it places that "deviation" effort in context! I promise not to allow any trolls to get me to expand further - because it is a huge subject. Evelyn!!!! How can you!!! ... put a link to the "Refugee Survey Quarterly Volume 35, Issue 1" ... LOL! But ... didn't you mean to say that he "ALWAYS justifies wrongs by lies"? Funny that our good friend John is not aware of the fact that since Gamal Abdel Nasser's time 10% of the University places are reserved for a free education of Palestinians - or doesn't he mention it because it doesn't fit his "narrative" ...? Strange too that he doesn't see the need to mention the extreme pressure Hosni Mubarak's regime was put under by the US and Israel to build a steel wall deep into the grounds between Gaza and Sinai - financed and technically aided by the US and was, therefore, forced to lie to the Egyptian people denying that it was doing so? Etc. ... as you said: a huge subject not fit to discuss as a deviation. If the Zionists wanted a PR person to clean up their image, why would they choose this one who keeps sullying their reputation and adding insult to injury? Thanks Eleonora for reminding us of just one example of what Egypt did to alleviate the suffering of the Palestinians that was inflicted on them by those murderous, inhumane, terrorizing Zionists! Sam - could it be that the selection is quantity based rather than quality based? Taking all these different cultures, but SIMILAR HUMAN BEINGS, humankind is waging a war against itself. War will never achieve any peace. As I said earlier - the whole issue of refugees & policy towards the refugees is a massive & complex issue - not connected to the topic in hand. Sam: On the contrary, Eleonora was happy to cite Israel's misdemeanors against the Palestinians whilst completing ignoring her own country's misdemeanors against the Palestinians. And Egypt's misdemeanors are even worse than Israel's. The Israelis have been involved in a de facto war with the Palestinians for the past 60+ years. The Egyptians are the Palestinians fellow Arab/Muslim brothers, so what's their excuse????? It is gross hypocrisy. John - I have to praise you for your steadfastness in spreading ever so many Hasbara lines right out of the manual. I'm almost - but only almost - tempted to send you a Green Star - LOL. If you'd support your "marketing lines" like "Egyptian policy towards the estimated 50,000 - 70,000 Palestinians residing on its territory has resulted in depriving them of basic rights." with some link one could follow or some examples of which basic rights the Palestinians are deprived of by the Egyptian government I'd be happy to address them or find out more and then come back to you. But this way ... sorry me no can do! One little correction: I wished that Egypt is "my country" as you claim but it's only my chosen country of residence. I could speak with more authority would it be mine. One big correction: Israel is NOT involved in any war with the Palestinians for the past 60+ years. Let's call a spade a spade, shall we? - Israel is involved in stealing the land of other people. - Israel is involved in displacing and killing innocent civilians (Christians and Muslims alike) who stand in the way of their expansionist dreams to create Eretz Yisrael. - Israel is involved in a brutal occupation of indigenous people who fight to liberate the remainder 22% of their homeland from the military occupation. Israel is involved in annihilating an entire people. - Israel is involved in the dirty war on the legitimate regime (like it or not) in Syria. - Israel is involved in almost every dirty game taking place in the region and beyond. The list is incomplete but can be edited if you so wish. Most important of all: even if it is true that the Egyptian Government is denying basic rights (as you put it) to the Palestinians ... shouldn't it be your first concern that the Egyptian Government is doing the very same to millions of Egyptian citizens (Christians and Muslims alike)? Even more important: two wrongs don't make a right - what's this got to do with what Israel is doing to the Palestinians? Do you truly believe that citing all the bad in the world gives a fig leaf and an excuse for the atrocities committed by Israel against Palestinian Christians and Muslims which are violating international laws and constitute war crimes and crimes against humanity? You have one strange "common sense" I must admit! John - I've decided to give you a Green Star for your last posting above. To call what Israel is doing to the Palestinians ... "misdemeanors " ... definitely merits a Green Star!! In criminal law. A general name for criminal offenses of every sort, punishable by indictment or special proceedings, which do not in law amount to the grade of felony. A misdemeanor is an act committed or omitted in violation of a public law either forbidding or commanding it. This general definition, however, comprehends both "crimes" and "misdemeanors," which, properly speaking, are mere synonymous terms; though, in common usage, the word "crimes" is made to denote such offenses as are of a deeper and more atrocious dye; while smaller faults and omissions of less consequence are comprised under the milder term of "misdemeanors" only. In the English law, "misdemeanor" is generally used in contradistinction to "felony;" and misdemeanors comprehend all indictable offenses which do not amount to felony, as libels, conspiracies, attempts, and solicitations to commit felonies, etc. And see People v. Upson, 79 llun, 87, 29 N. Y. Supp. 615; In re Bergin, 31 Wis. 386; Kelly v. People, 132 111, 363, 24 N. E. 56; State v. Hunter. 67 Ala. 83; Walsh v. People, 65 111. 65, 16 Am. Rep. 569. Tell Congress: Support Palestinian children's rights. As the situation for children living in the occupied West Bank, including East Jerusalem, rapidly deteriorates, Palestinian children pay an increasingly high prices for Israel’s prolonged military occupation. Write your members of Congress today, asking them to urge President Obama to appoint a Special Envoy for Palestinian Children. Tell President Obama to Appoint a Special Envoy for Palestinian Children. Children under 18 years old now represent 46.2 percent of the 4.68 million Palestinians living in the Occupied Palestinian Territory. These youth are growing up under prolonged military occupation where systemic discrimination and violence has stifled future prospects. I am particularly concerned by the Israeli military’s widespread and systematic ill-treatment of Palestinian child detainees. At the end of February, there were 440 Palestinian children in Israeli military detention. This is the highest number since data became available from the Israel Prison Service in 2008. For the first time in nearly four years, Israel has reintroduced the use of administrative detention against children, a procedure whereby a child can be detained without charge or trial, often renewable indefinitely. I urge you to sign-on by May 20th to the Dear Colleague letter initiated by Rep. Betty McCollum (D-MN) calling on President Obama to appoint a “Special Envoy for Palestinian Children” for a fact-finding mission that will provide the administration with information vital to actively promoting human rights. The Special Envoy will travel to the West Bank, including East Jerusalem, and Israel and hear directly from Palestinian youth, human rights and legal experts, NGOs, and Palestinian and Israeli officials. The United States has a critical role to play in shaping the environment for peace between the Israeli and Palestinian people. We urgently need you to send a clear signal that the American people value the lives and safety of Palestinian children.